1) BITE Beauty 5 Night Fix for Lips ($15) Not only is this lip transforming duo super cute and affordable, but it contains a mini version of BITE’s cult favorite Agave Lip Mask (one of my beauty arsenal must-haves!) The 5 Night Fix comes with a deluxe mini Whipped Cherry Scrub Stick and an Agave Lip Mask that you use together nightly to restore, replenish and revitalize your lips. The scrub contains castor oil beads and fruit extracts which work together to smooth, brighten and restore lips and the yummy lip mask contains agave and Madagascar vanilla to help repair and nourish parched, chapped lips overnight. Loving this dynamic lip duo to prep my pout for some serious smooching this V-day! 2) Truelipz Lustre in Deep Ruby Red ($24.95) is an exciting innovative new lip discovery of mine. Truelipz products contain a wonderful array of lip rejuvenating ingredients like lanolin, dragon’s blood (a bright red tree sap found deep in the Amazon rainforest that helps form a protective healing barrier on your lips), castor seed oil, avocado oil and jojoba seed oil which all work together to hydrate, condition and heal your lips. I was totally surprised that this gorg gloss was so much more than just lip color – it’s actually more of a treatment that is super emollient, healing and has hydrating benefits that lasts for days. Love how noticeably soft and supple my lips are after using this gloss! 3) J.Cat Wonder Lip Paint in Red Queen ($4.99) A couple of weeks ago, I was scouring the floors of the big pro beauty show called ISSE in Long Beach, CA and I stumbled upon this fab new makeup brand and was instantly smitten. J.Cat Beauty is an under-the-radar makeup brand with an impressive assortment of hip trendy pro quality makeup at insanely affordable prices. I was blown away by their new Wonder Lip Paints which are an equally as impressive but much more affordable dupe for OCC Lip Tar! Wonder Lip Paints are intensely pigmented long wearing lippies that come in a super fun array of colors. Red Queen will be my go-to this Valentine’s Day, and for $5 why not buy two?! 4) L’Oreal Paris Infallible Pro-Last Lipcolor in Red Infallible ($12.99) is a fabulous high-intensity, long-lasting, transfer-resistant lip color that glides on with a moisturizing feel and lasts up to 24 hours! The first step is the High Intensity Color that resists fading and bleeding and then you apply the wonderfully hydrating Pro-Seal Balm to lock in the color and moisturize your lips. You can also reapply the balm throughout the day to refresh and hydrate your lips. I love the great assortment of colors, how nourishing the balm feels and that the balm totally brings my lips back to life. 5) Fresh Sugar Rosé Extreme Tinted Lip Treatment Sunscreen SPF 15 ($22.50) Many of you are probably familiar with the swoon-worthy Sugar Lip Treatments that come in a variety of hues that moisturize, protect, and smooth the lips while leaving a beautiful hint of color. Well, Sugar Rose Extreme does all that plus it’s also enriched with rose oil, which has an alluring sensual scent and is known for its incredible hydrating properties. I couldn’t resist the chic roses on the case, the flattering rose lip tint and the scent of roses which totally screams Valentine’s Day to me. 6) Pixi Shea Butter Lip Balm Trio ($8) I am a longtime fan of all things Pixi because of their clever quick fix makeup products, gorgeous palettes, fun feminine packaging and affordable prices. This yummy soothing shea butter lip trio is no exception! The set comes with a Comfort Clear, Honey Nectar and Ripe Raspberry balm and they are packed with hydrating shea butter and healing vitamin E. I really like that they have the perfect level of hydration and a beautiful hint of flattering color. 7) bareMinerals Modern Pop Marvelous Moxie Lipstick in Fall in Love ($20) is a creamy, super-saturated, ultra-pigmented lip color with a rich satin finish. This lipstick contains a wonderful infusion of vitamins, minerals and a hydrating complex which work together to nourish and revitalize your lips, plus every Modern Pop Lipstick comes with this super cute chic lipstick case. I love this creamy richly pigmented tanwy peach hue that makes my lips look full and pouty. Kisses anyone? 8) Tattoo Junkee Pucker Up Red Lip Paint & Glitter Set ($6.88) I am obsessed with this long lasting duo of red matte lip color topped with true red glitter that looks like ‘Dorthy’s Ruby Red Slippers’ on your lips – it’s FAB FAB FAB! Whenever I wear this red Pucker Up duo, people stop me all the time to ask what I am wearing. It lasts for hours and it’s perfect for Valentine’s Day or anytime you want to get noticed. LOVE! 9) Kaplan MD Lip 20 Mask ($48) This exciting new lip mask from Beverly Hills derm Dr. Stuart Kaplan is the first ever lip mask that offers the look of professional lip injections at home. It contains a proprietary Hyaluronic Acid, Marine Collagen and Natural Fruit Enzymes which all work together to instantly plump your lips while exfoliating away flaky, chapped skin. This ground-breaking mask makes your lips softer, smoother, fuller, and more luscious. Top it with Lip 20 Ultra-Hydrating Balm for the ultimate anti-aging lip treatment. Must try! 10) Aveda Nourish-Mint Smoothing Lip Color in Goji Berry ($16) is a gorgeous lipstick infused with pomegranate to heal and repair the lip’s surface and organic spearmint and vanilla to subtly freshen your mouth and elevate your spirits. This impressive lipstick noticeably hydrates, plumps, and smooths your lips after a couple weeks of use. I’m obsessed with this luscious vibrant true red hue and the hint of mint that brightens my mood and cools my lips. 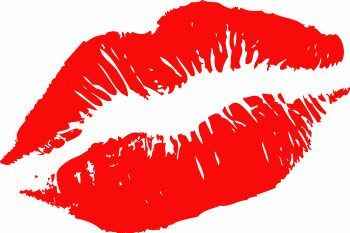 Disclosure: An assortment of the above lip products were sent to me for editorial consideration, however my kissable pucker is my very own. In celebration of Valentine's Day and all things hearts, lips and kisses, I curated 10 fabulous products that my lips are loving and can't live without. MUWAH! « Dame Edna’s Glorious Goodbye at the Ahmanson Theatre: A Possum of a Good Time!